The one where I make a hash brown casserole, that is kind like a normal hash brown casserole, but with a secret ingredient that sort of makes it the best ham and cheese hash brown casserole known to man. 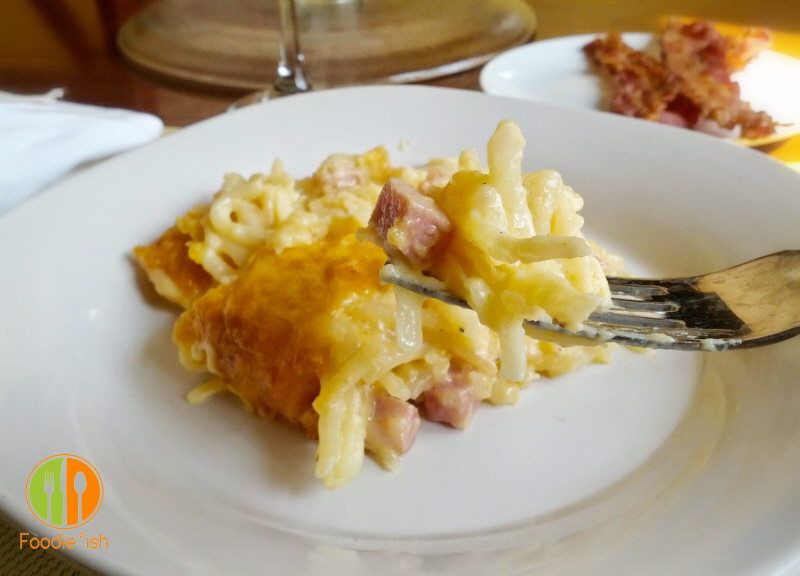 So unless you like delicious, ooey-gooey-cheesy yumminess, you can skip this recipe. So this morning he vowed, no working. Only eating and napping. 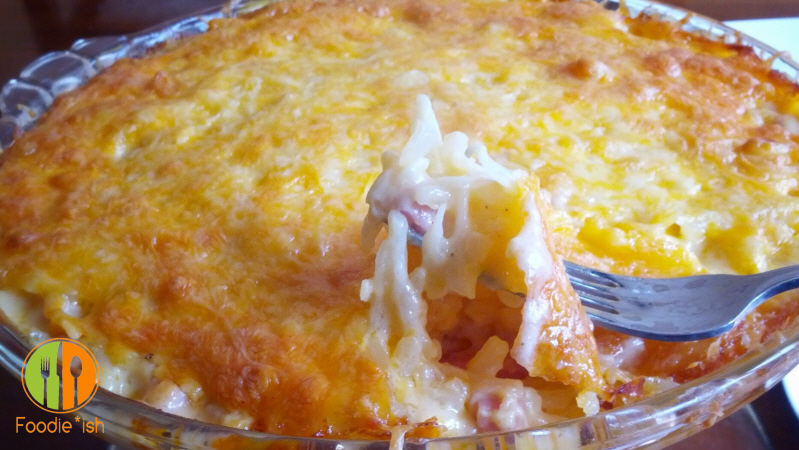 I think my reaction was something to the effect of “HOT DAMN!” and then I started to whip up this oh-so-delicious, creamy, cheesy, hearty ham and cheese hash brown casserole. 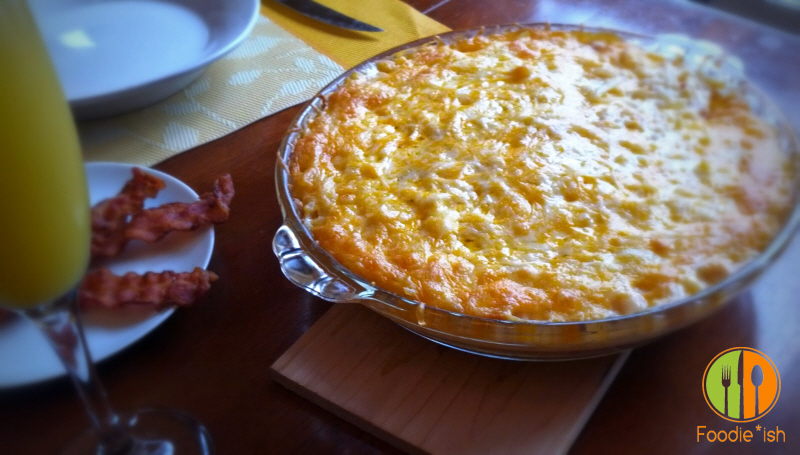 I mean, let me just give a shout-out to you, cheesy deliciousness that is my ham and cheese hash brown casserole. You, sir, are a star! I created this bad-boy a couple years ago when I had both my in-laws and my parents staying at my house for Christmas, and needed something I could prepare ahead of time and pop in the oven for breakfast Christmas morning. I paired it with a super fantastic spinach-artichoke & smoked sausage egg bake. That is also a must-have in your prepare-ahead breakfast foods arsenal, so I will definitely share that as soon as I can. 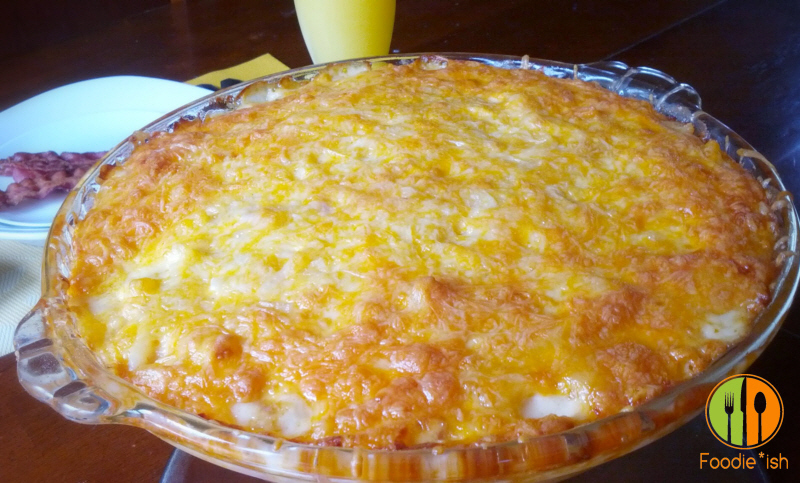 But this ham and cheese hash brown casserole could easily have been the main event. It is filling, but not heavy. And has all the food groups: Protein, starch, and cheese. Wait… what???? There are more than that? Alfredo sauce! Light Alfredo sauce in this case because, like a guy who orders a Diet Coke with his Big Mac, I try to be calorie conscious. I also use four cheeses and add some paprika and ground mustard. Oh, and HAM! Ham and cheese are like peas and carrots. They are a match made in food-heaven. You simply can’t go wrong with ham and cheese. Not ever, not no how. And because I am lazy on my lazy Saturday, I didn’t even procure the goods. I had the Mr. do it. And he got the wrong cheese (I wanted a double block of cheddar… like 16 oz instead of 8oz of sharp cheddar, but he got a marbled white and mild cheddar– a double cheddar 😉 but no prob, Bob… this is Foodie*ish, so we made do. And ya know what? I think his accident was a blessing because it was perfect. Mild and creamy, not over-powering like a sharp cheddar sometimes can be when combined with other delicate flavors. Scrumptious! So good on ya, accidental food dude! You won Saturday with your double cheddar! Yay! And like most recipes I create, you can literally change this up a thousand ways, with whatever you’ve got on hand. Use sausage instead of ham; introduce a little spinach or mushrooms. Or switch it up and add a little saffron and sub chorizo for the ham, toss in a red pepper and you’ve got a sorta-Spanish version. Oh my… that sounds so good. I’m gonna write that one down. That is a must try! 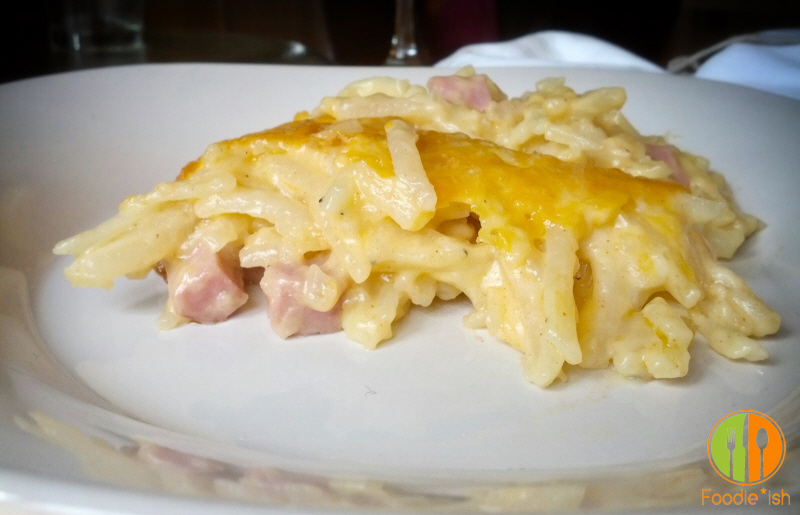 So here we go, my rich and creamy, velvety and satisfying, hammy and cheesy, Ham and Cheese Hash Brown Casserole. Preheat oven to 350. Shred cheese into a large bowl and fluff to combine. 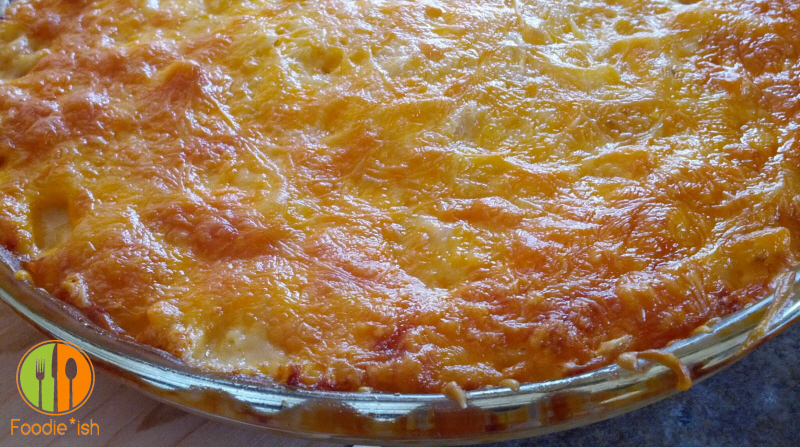 You should wind up with about 3 cups of freshly shredded cheese. Dice ham steak into small 1/2 inch bites. To the sauce mixture, add 2/3 (roughly 2 cups) of the shredded cheese and ham and gently stir to combine. 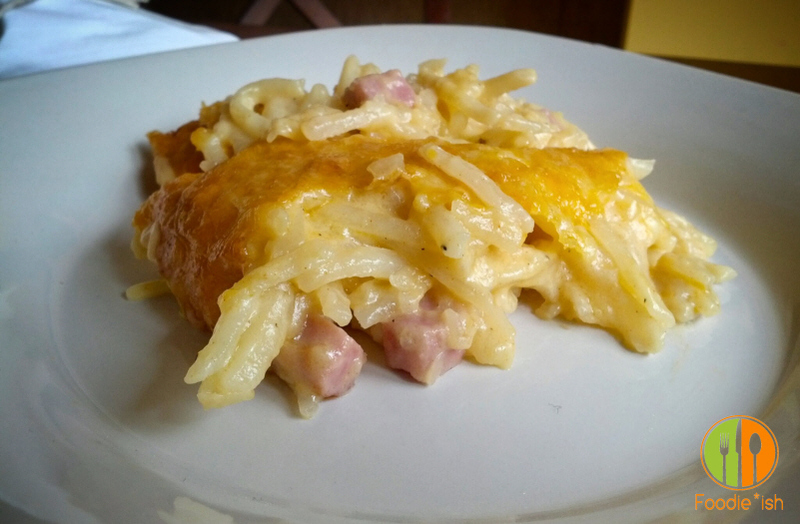 Add thawed pre-shredded hash brown-cut potatoes, and thoroughly incorporate into the sauce and cheese. Grease a 9 1/2 inch glass pie pan or 6″ x 9″ glass baking dish with butter. 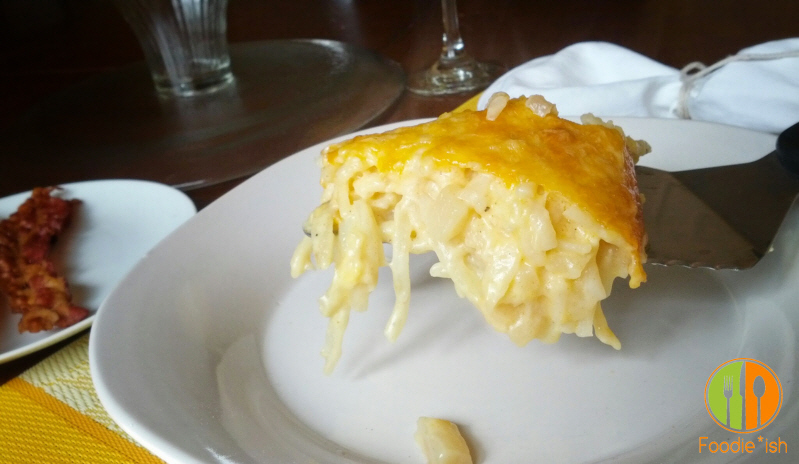 Spread the hash brown mixture evenly in the pan and top with remaining 1/3 (roughly 1 cup) shredded cheese. Place in oven, uncovered on center rack and bake for 1 hour, or until bubbly and cheese starts to get golden. Let stand for 15 minutes before serving.